My second piece for the Ixalan release of Magic: the Gathering is this rather simple image, yet there were a couple of ways for me to make it less-than-simple. 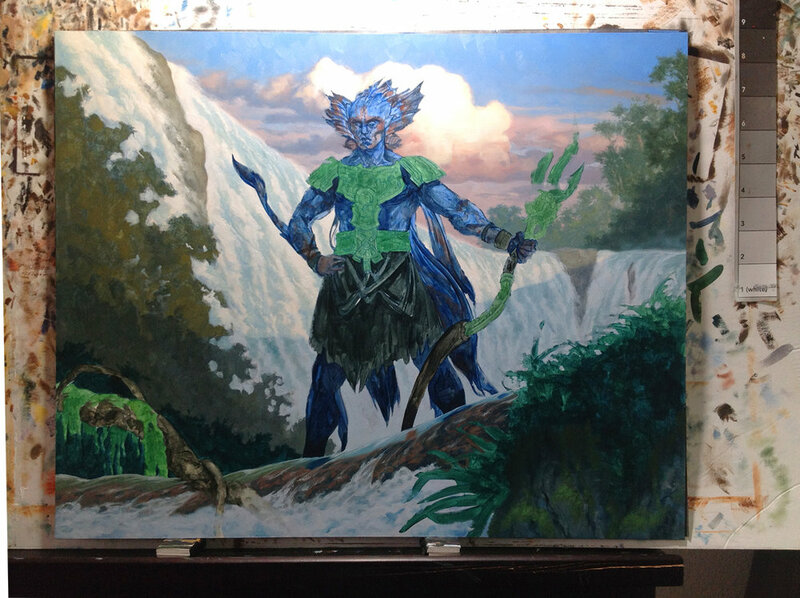 For starters, as mentioned in my breakdown for Ixalan Merfolk, I usually do the heavy decision-making on which image to present to the Magic Art Director myself, giving them just a single option to thumbs-up or down. 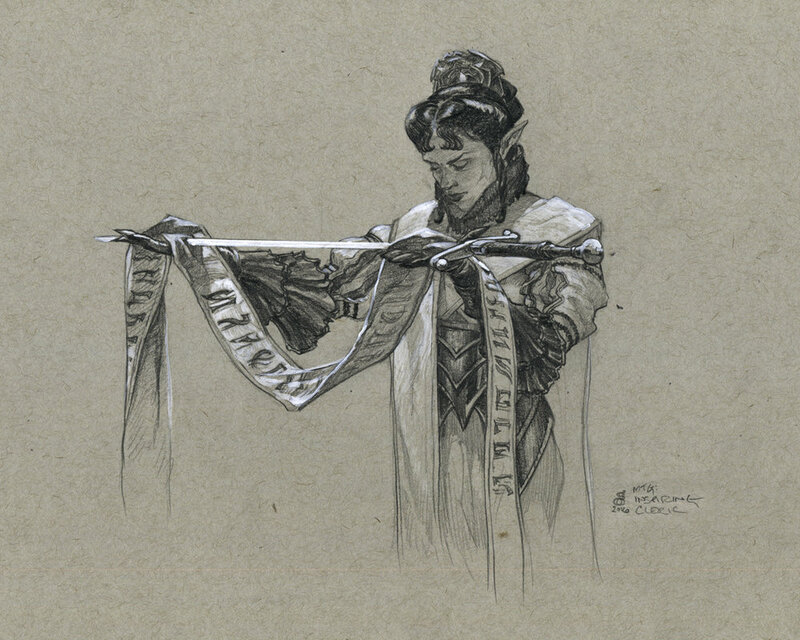 For other types of clients, multiple sketches might be required or preferable but with Magic, the overwhelming majority of the time, one is sufficient. If anything I might get a little bit of, "Make sure you focus on this bit," or, "Adjust the [thing] a bit like so, but go ahead." It's pretty rare that I'm sent back to the drawing board entirely. But sometimes, there might be cause to submit more than one image for the Art Director to choose. The first reason is because I simply can't decide which one to choose, so rather than make that awful choice, I'll leave it up to the Art Director. The other is that while I may prefer one very slightly over another, the other has an aspect that the first doesn't which might be more important as a card or composition. In this case, it was more the latter. The assignment was fairly simple: show one of the Conquistador-inspired Vampires presenting a sword wrapped with some fabric containing some of the pre-designed and gothic-inspired text used by their culture. The environment in this case was to be the interior of one of their galleons, though that wouldn't necessarily be obvious in a small format. However, it gave me enough to go on, and the darker interiors would play nicely with the pale fabric and skin. Both studies, as submitted to Art Director Dawn Murin. Compositions like this tend to be a bit more limited in that with the pose being specified, there are reduced opportunities for what to do or show. I liked this sort of at-angle version best from my thumbnails, and worked up the study of it. However I thought the presentation-of-the-weapon aspect was not necessarily as obvious as the version that had the character presenting the viewer with the sword; additionally, by making the figure more straight-on, it was more clear that she was holding a sword. Straight forward and side portrayals tend to emphasize shapes and objects much more than at-angle views. So, I worked up a second study and submitted them both. I wasn't going to be surprised either way, but they went with the first study, and I was off to the races. Choosing a size for a painting is a struggle on its own. If you take a figure, say, and enlarge it many times by intervals, you start to get a sense that some of the sizes are good for painting at, and others are bad. And as the figure grows, it's strange, you'll find it's good at a number of growing sizes, then it may hit a streak of enlargements that would be less-than-ideal, and then it suddenly gets to good enlargements again. I think a lot of traditional painters would agree with this, though for any given composition we might differ on where those lines are for each of us. But in this case, I chose an 18x24" panel, for only the second time. 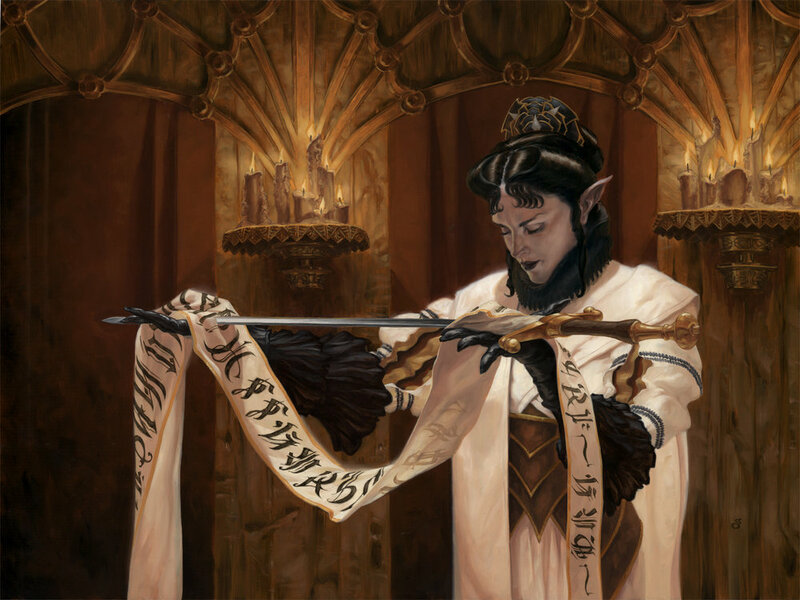 I mentioned back in the run down for Vizier of Remedies that my newest entries in Magic illustration were being done a bit differently. Only taking an occasional commission now, I am more intent on just enjoying them as paintings; this means that I can choose larger sizes more often, which I might've chosen before but which were painted smaller than I really wanted sometimes just because I had more commissions to get done. In Magic: the Gathering, token cards are interesting--they are cheap and the opposite of a power card. But unlike a run-of-the-mill common card that may just never see play, since these are proxies for things that happen fairly commonly in-game, they end up seeing a decent amount of use when that token is usable in the current tournament cycle. So, Merfolk. Along with their Lorwyn set counterparts, these merfolk designs feature heads with fins. 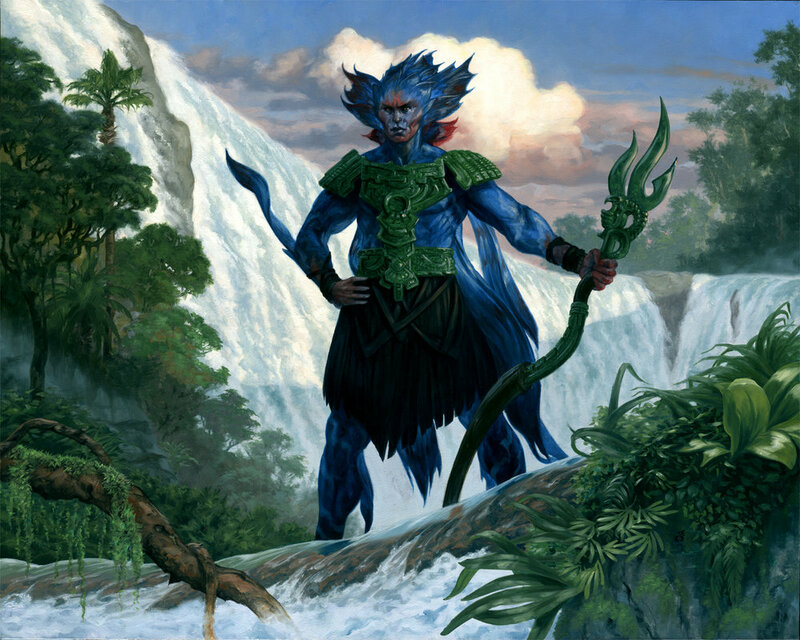 The assignment called for a particular kind of merfolk standing astride a river, weapon at the ready, in a sort of guardian pose. 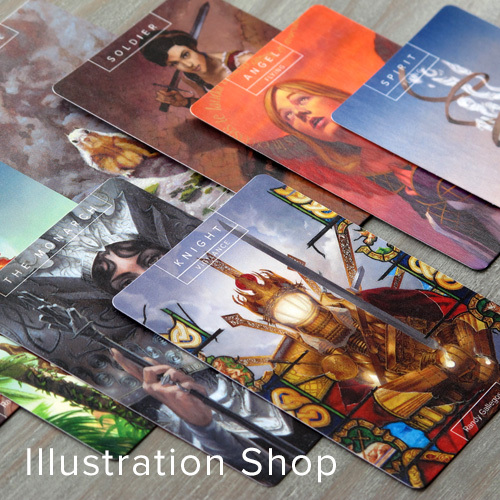 Simple enough, and since the card design features larger-than-usual art to be printed, it also allowed me a little more room to add in more detail that might be unwise in an illustration reproduced at a still smaller size. You can see a few that I starred in the upper right. These were among the ones I had to agonize over before picking one for final. The one directly under the one chosen was a very strong contender as well, and a year later I'm not sure why it wasn't chosen. I quite liked the lower-right one too, but the kneeling pose was too reminiscent of an older piece of mine, Sway of the Stars and so I think that was why I decided against it. From there, a study was done using a combination of acrylic, ink and pencil. I've been utilizing this combo of materials quite a lot with some of my work for Every Day Original, and it's started leaking back into my other work. Acrylic block-in, AKA "The Ugly Phase"
When working on the figure, I've generally adopted the philosophy of nail the face before moving on, so after pushing it around for a bit and feeling satisfied, I was off to the finish. The merfolk design includes these fins that come off various parts of the anatomy, including one that kind of projects outward from the elbow. On the left you can see it clearly. In the sketch, I kinda had it tucked behind the arm, in the direction it would've gone, but I decided that at card size that would confuse the shape of the arm, so made the assumption that it was running behind the upper arm, but out of view, to keep things clear. After some discussion with the Art Director I went in digitally and added it as another silhouette shape (you can see the final on my Illustration portfolio page), I also did a couple other small digital tweaks by request, but above is how the painting was completed. 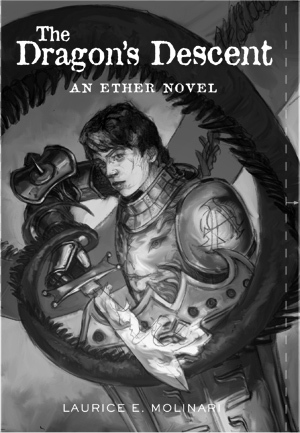 Working on Laurice Molinari's series The Ether was a lot of fun, coming as it did at the beginning of the year over the course of three years. The series varied a bit in its execution each year. Where the first book had me reading a completed manuscript and concepting the illustration, the second and third book had to be painted before the final manuscript was in, in both cases. That meant getting a brief for the type of scene or image they wanted to see, which is a lot more challenging. For the third book, we had the title and I was given the task of showing Vero armored up and ready to do battle. That's about it. My initial sketches included a couple of concepts that I really pushed for, that were a bit more symbolic than literal, in that since we didn't have any text to go on, I intended to portray Vero armored, but with the enemy clearly indicated as wanting to destroy him. There were also a couple of others that featured the dragon in one manner or other. It took an awful lot of back-and-forthing on this piece for some reason, despite having numerous solutions that worked well. In the end we settled on one and I got to work. I think by the time I got the go-ahead on the final, the actual deadline had passed. Not my fault! My sketches were in on time but there were very long stretches waiting on approvals, tweaks, new concepts, approvals. When it came time to go it was basically a matter of needing it yesterday. I got to work, beginning with an acrylic underpainting and then switching to oils. I probably will never get to reading the other two books in the series, unfortunately, but I hope the direction I got does the stories justice. It is a shame I wasn't able to read the stories, as interpretation is a large part of what an illustrator can bring to the table. It's not that Art Directors and Editors have bad ideas necessarily (though sometimes, they really do), it's just that I think you tend to get the best from an illustrator when they are able to bring their whole creative selves to a project. In any case, this series is wrapped up as far as I know, and it was good fun. The paintings, too, have been well received and all three covers sold fairly quickly. A couple of months back I was assigned a regular slot on Every Day Original, a great site for finding new original art daily, for $500 or less. 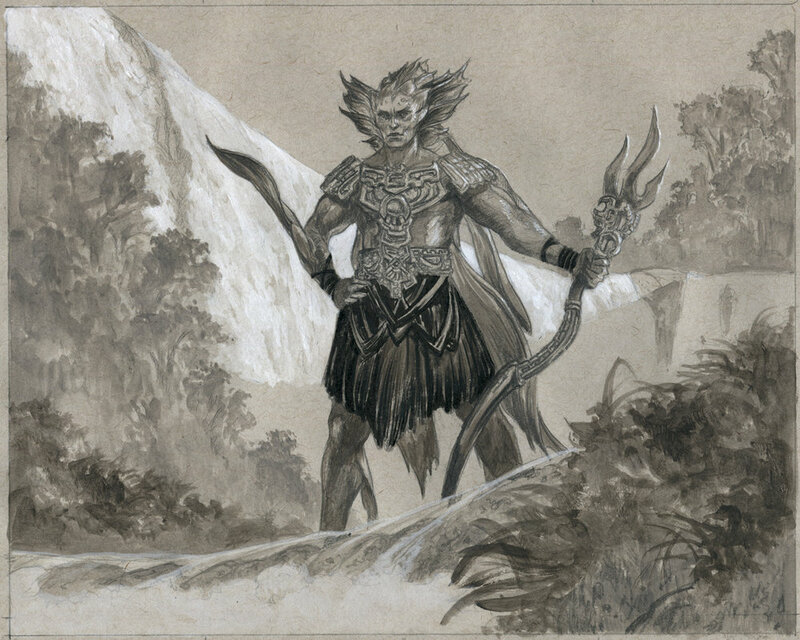 If you are new to collecting original art or have been thinking about getting into the game, it's a great site to dip your toe in. My assigned day is the 28th of each month for now. Unfortunately, this falls right into the dead space following the two major end-of-year holidays! Ah well. I've thought about trying to use my art for EDO as a way to advance personal projects through small originals, or maybe preliminary works on larger studio paintings. When we last spoke in October, I was between a slew of events that devoured a couple of months. The last of them was a one-two punch of IlluXCon and the annual painting retreat I've mentioned here a few times before. As I've said before, my goal with those painting retreats has been to work on non-commissioned works there, and this year was no different. I was once again behind the ball heading in. Last year, I barely managed to get it together to begin working on "Glossai Pyros." This year was no different as the retreat began the very day following IlluXCon, which itself had begun just a few days after showing at the Portland Retro Gaming Expo, where I had my Hearts for Hardware work on the road. Whew! What I thought I'd work on at the retreat wasn't to be as I ran into delays with the model I was working with. So very last minute I had to call an audible. And by last minute I mean one day before leaving to IlluXCon. I knew my EDO post would be going up the Wednesday of the retreat, but I'd have no time until I got there to work on it. So I dug through my Artist Proof sketches and pulled out the scan of the one at left, which was done on the back of a "Dryad's Caress" card awhile ago. I had the reference photo for it still. I also had a 6x8" canvas prepped so I went about redrawing it in paint straight on the canvas with tweaks and corrections. I did an underpainting, put an isolation coat on it and packed it. I also did an underdrawing of a small Hearts for Hardware piece, then packed and left! Arriving at the retreat Monday after the show, I immediately unpacked and got straight to work. I usually do anyway because it's plenty inspiring being there and I want to work a lot there. In the midst of so many talents, I can paint all day long with very little fatigue that might set in at home on my own. Long story short, I burned the midnight oil and photographed the piece to post on time. Having chosen an autumnal theme to the color version, I brainstormed some titles with Daren Bader late one night and arrived at "Decidua." As I enjoy working in series, I also chatted with Daren about doing so, and decided to go for it. Winter would match with my December offering, but as snow came early this year and I was plenty excited about continuing the series, I did the next one for November. Thankfully, "Arctis" brought snow in real life and we had to cancel primary Thanksgiving travel plans. On the one hand a snowy getaway would've been wonderful, but I was once again behind heading into Thanksgiving week and I didn't relish the thought of bringing my tiny setup with me. So I was able to stay home and work on this piece in warmth and comfort. I took a number of photos in-progress this time and made a little movie I posted around social media. I'll naturally follow this with same-sized harbingers of Spring and Summer. The plan is to have them ready for late April and May, respectively, whether or not I'm still contributing to EDO.